Villa in a beautiful and quiet location, sleeps4/6. 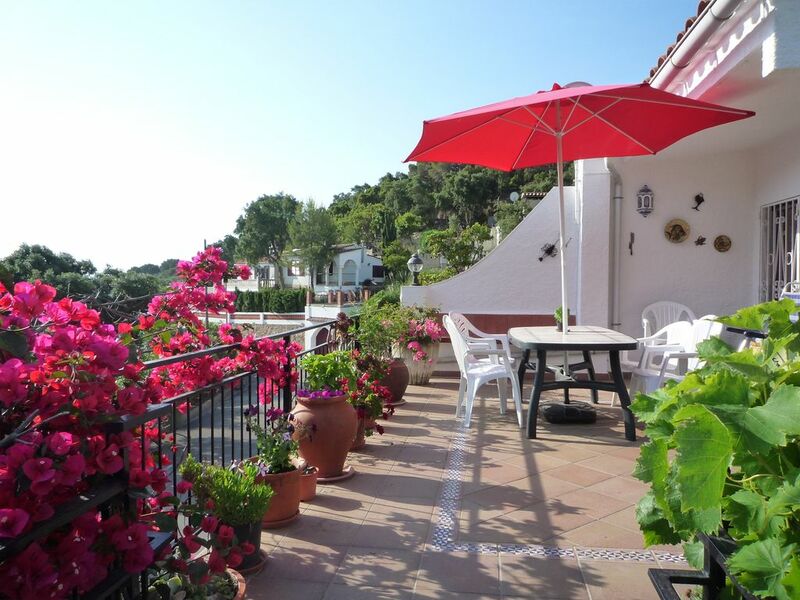 The Villa Set above a hidden tranquil bay near Tossa de Mar and is in a quiet cul-de-sac. Free WIFI. In front of the villa there is a pleasant park with pinewood and palm trees, the villa is part of a small very quiet, exclusive development 5 minutes to beaches, restaurants, shops and beautiful countryside. Villa is only 6 Km from Tossa de MarThe main villa, sleeping 4/5, has two bedrooms and a spacious well furnished living room with a sofa/bed , and with dining area, fully fitted kitchen, and 3 large terraces with barbecue. The villa near Tossa de mar has full central heating. There is a large car parking space in front and the back of the villa of the villa. Please e-mail us to give you the address of our own web site for more information and photos about the villa near Tossa de Mar. Location: Easy access from Barcelona airport (70Km, about one hour), and Gerona airport is only (25Km), 25 minutes from the villa. In a very quiet location close to all year round resort of Lloret De Mar (6Km)and historic Tossa De Mar(6). Small supermarket for all basic needs 4 minutes by car from villa. Excellent large supermarkets 7 minutes by car in Lloret and in Tossa. Lovely beach Cala Canyelles 4 minutes by car or a pleasant 20 minute cliff top walk. 15 minutes walk down the Unpaved sandy footpath hill (includes 104 steps) to the secluded local cove Cala Morisca (no access by road). Historical and other sights: The beautiful old city of Girona is a 25 minute drive away with historical centre, shopping centre and good affordable restaurants making an enjoyable day trip. Barcelona with its many historical and cultural attractions, shops and the street theatre of the famous Ramblas is reached by car (one hour), bus (one hour)or train within one hour.Centres of art and ceramics - Bisbal, Dali's museum in Figueres and other resorts - are all within reach by car. Other attractions: Lloret caters for all ages, large beach, a pleasant sea front, and all kinds of activities with Waterworld (the largest water park in Europe) Go-Karting, boat trips, Marineworld, and a lively night life. Nearby Blanes and Tossa are attractive traditional resorts with pleasant promenades, beaches and restaurants. The weather is very good. summer temperature about 27 C max. Winter about 9 C max. lovely place to relax. The villa is on three levels with street access from both the rear and the front. A double and twin bedrooms are on the top level with a few steps down to the bathroom with shower, wash basin and WC. The kitchen and main living room are on the next level down a few more steps. The living room gives direct access to large terraces with lovely views to the sea and surrounding hillside. The studio is at street level, a fully equipped kitchen and dining area, with its own bathroom and entrance. The villa is equipped with Washing machine/ironing board and iron etc. Baby high-chair, cot can be arranged.